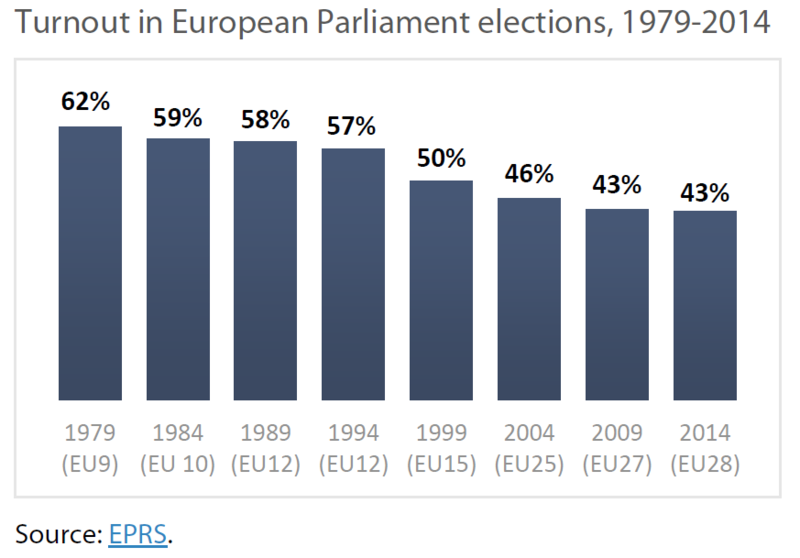 European elections have long been referred to as ‘second-order’ national elections – elections perceived as less important by voters than national elections, with no government/prime-ministerial candidate at stake. Moreover, EP elections were mostly dominated by national issues and domestic politics. The turnout in EP elections has been low and constantly declining, reaching a record low of 43 % in 2009 (a similar downward trend can be observed in national elections). Establishing a genuine link between the European elections and the president of the EU executive was expected to help arrest this trend, as EU voters could now have a say over who would head the European Commission (and, were the incumbent Commission president to stand for re-election, remove them based on performance). Moreover, linking the head of the executive to EP elections would make the European elections somewhat more akin to what most voters know in the national context. Voter mobilisation was further to be achieved by personalisation of the campaign through these leading figures, and injecting a dose of partisan politics in EU elections. All in all, the European Parliament aimed to create a ‘genuine contest for the top executive job’, and thereby transform the very nature of the EP elections. Not least, it also sought to reassert its influence vis-à-vis the European Council, largely seen as strengthened against the backdrop of the economic and financial crises.